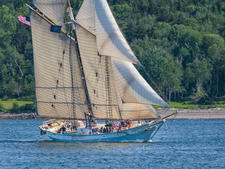 A traditional wooden coasting schooner, Heritage was designed and built by her captains, Doug and Linda Lee, with comfort in mind. That means stairs to the downstairs decks, instead of the ladders you sometimes find on sailing vessels, skylights to allow light below deck and a spacious galley for meals. There are 16 passenger cabins: 14 double-occupancy and two singles. Cabins range from 26 square feet for the small single to 67 square feet for some having double beds or over and under bunks. Each cabin has a sink with hot and cold running water, reading lights and 12-volt DC and 110-volt AC power outlets for recharging smartphones, tablets or cameras, or powering sleep apnea machines. Two cabins have private toilets. Three toilets and a hot-water shower are on deck. 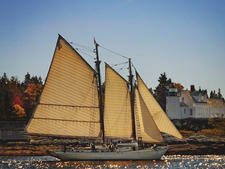 The schooner’s sailing season runs from early June through September, offering trips from three to six days. 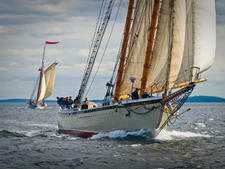 Destinations are most often determined by the winds, weather and tides, rather than a set itinerary. 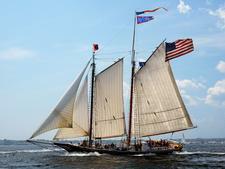 Heritage has a centerboard rather than a deep keel, which means the ship can anchor in shallow coves. Expect the cruise to take you to out-of-the-way places, as well as pristine island beaches. A lobster cookout highlights each cruise. Breakfast is served family-style in the galley and may include Maine blueberry pancakes with real maple syrup. Lunch is buffet-style, on deck while underway, and usually includes homemade soups and chowders for lunch. Dinners are served family style in the galley featuring roasts with fresh salads and vegetables. Bread is baked daily in the wood stove. Coffee, tea, and cocoa are almost always available. Passengers are welcome to bring other beverages, alcoholic or non, with them to chill in the large ice chest on deck. Passengers are invited to help sail, take in the sights, read or simply relax onboard. 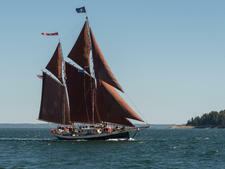 While at anchor, passengers can also go rowing or sailing in one of the three small boats. 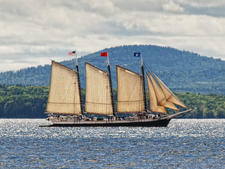 A collection of maritime and Maine books are kept in the galley. 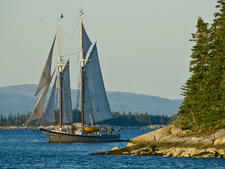 On clear nights, expect stargazing sessions or an impromptu lecture on Maine Coast maritime history. The minimum age for passengers is 12.